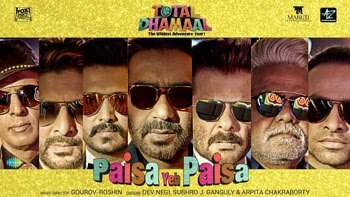 Paisa Yeh Paisa Lyrics - Total Dhamaal starring Ajay Devgn, Riteish Deshmukh, Arshad Warsi, Javed Jaffrey, Anil Kapoor, Madhuri Dixit. The song is recreated by Gourov Roshin and sung by Arpita Chakraborty, Dev Negi, Subhro J Ganguly. Its lyrics are penned by Kunwar Juneja.